Not all of us are lucky enough to have a private Muskoka getaway to escape to when the mercury soars, so if you are stuck soaking up the rays "turtle-pool"-side rather than dock-side, this Saturday is jam-packed with happenings on Danforth East. Doors Open Toronto runs this Saturday and Sunday, and the best news for this Pioneer is that the Greenwood and Danforth TTC train yard will be open to the public on Saturday afternoon. This is exciting, because as most people know, kids love trains, so there really is no better way to enjoy a Saturday morning than brunch at Sarah's or Ten Feet Tall (take that, cottage country!!) followed by a backstage pass to a "subterranean locomotion" repair shop. For history buffs, I have it on good authority (okay, from Joe Cooper at the Mirror) that the very same site was a quarry that served as a labour camp for German POW's during WW2. Danforth East is like an onion: peel back the layers and you never know what you'll find! 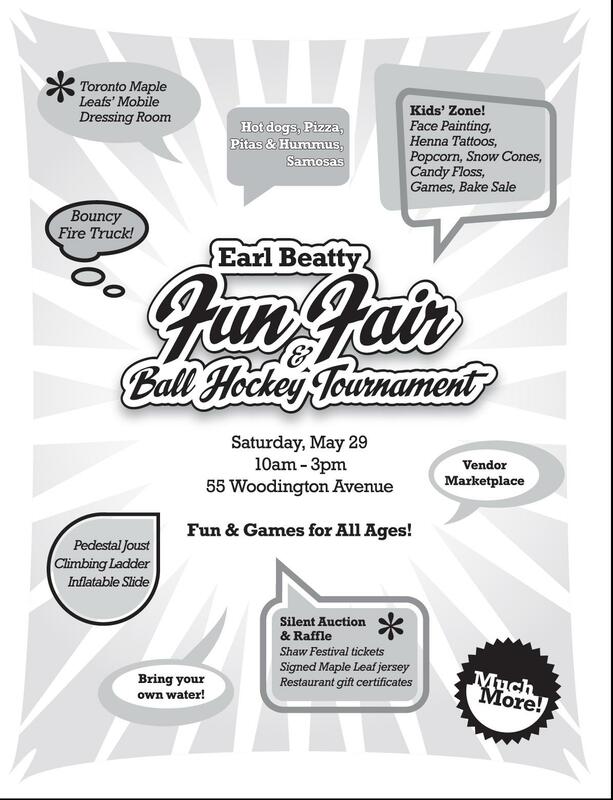 Also on Saturday from 10 a.m. until 3 p.m. is the annual Earl Beatty Fun Fair which offers fun and games for kids, a marketplace and silent auction for parents and general fun and mayhem all around! See flyer below. And don't forget: many homes on Danforth East will be holding a Yard Sale for the Cure (all proceeds go to Breast Cancer research), so get out on your bike early for all the best deals! Hint: good stuff to be found on Milverton, just west of Monarch Park!